We had about a cup of roasted tomato puree leftover from making that Moroccan-inspired salmon the other night. I really wanted to use it to make golden tomato soup for lunch to serve with sourdough grilled cheese sandwiches, but there wasn’t quite enough, so I stretched it a bit further with the addition of some chicken stock and a splash of cream, and gave it bulk with pearl barley and the last of my purple hull peas. I also enhanced the yellow coloring with a sprinkle of turmeric and a contrasting garnish of paprika and black lava salt. Talk about a bowlful of sunshine—always a welcome sight as we move into autumn with its shorter days and cloudy skies. Jeremy was not very excited at the prospect of soup for lunch, particularly when I mentioned that I had thrown in a little pearl barley. But he quickly came around and said it was much tastier than he had anticipated, a perfect sop for grilled cheese after a busy morning doing yardwork and volunteering at the community garden. Combine about 1 C roasted tomato puree (mine was a blend of golden heirloom and cherry tomatoes, yellow bell pepper, onion, garlic) with 3 C homemade chicken stock, 1 C shelled purple hull peas, and 2 T pearl barley. Bring to a simmer and cook until the beans and barley are tender, about 45 minutes, adding more stock if the barley absorbs too much. Then add 1/3 C heavy cream, a sprinkle of turmeric powder, plus garlic powder, salt and pepper to your taste. Garnish if desired with a dash of sweet paprika, chipotle powder, and/or a pinch of flaky finishing salt. Grilled cheese and soup is one of my favorite lunches 🙂 Your soup looks fantastic! That sounds (and looks) amazing! Beautiful soup. We have tons of tomatoes from our garden right now and we cannot possibly eat them all. This is the likely fate of most of them. a good one for the coming winter months, i’m sure… thanks for sharing! what an absolutely beautiful bowl of soup! congrats! I will make this one! Serendipity, it’s mine too! My husband is not nearly as enamored of soup as I am, but I sneak some onto the menu every so often. Sommer, for a meal cobbled together from bits and bobs, I was really pleased with the way it came out, especially that sunny yellow color. Speakeasy, thanks! Last week I thought i was swimming in tomatoes, and now I wish I had more. 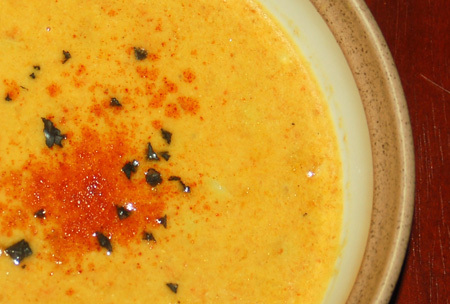 That roasted puree is a great base to have on hand. Debbie, thank you! Let me know how it goes! Love the combination of flavors! Thanks for sharing! I have always wanted to try black lava salt….is it a strong flavor…your soup looks great…love the fall colors. Shannon, I didn’t notice a strong flavor from the salt, but I only used a little sprinkle. I’ve been having a hard time figuring out when to use it, since it can make it look like you accidentally burned your food. 😛 It is so beautiful, though, with those pyramid formations, that I wish I could find more ways to showcase it like this!